Mini steppers are a great addition to your home aerobic workout regiment. Consistently moving your legs up and down helps increase the heart rate and burn calories. This mini stepper comes with a handle set and computer console to help you keep track of time, steps, steps per minute, and calories burned. The MX1 also helps keep you safe with slip-resistant pedals. 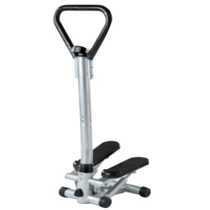 Orders your stepper exercise equipment here today. Our previous Mini Stepper with Handles brings you greater stability while performing your stair stepper exercises. 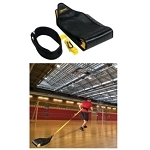 The handles can be gripped to help you maintain your position or regain your balance while exercising. The HERS Mini Stepper is a great alternative to the discontinued mini stepper with handles and provides a great cardiovascular workout in a small compact design. The stepper offers a low-impact stepping workout which will tone your calves, thighs and buttocks while the digital LCD display helps keep track of your calories, time, reps and rate. Our previous Exercise Stepper models did not have this same functionality, but included resistance bands instead. With this newer stepper comes a computer console to help you keep tabs on your exercising progress. Great for home use. Get a full body workout at a great price! This mini stepper does it all. 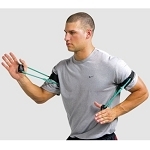 While using the stepper, pick up the resistance bands and work your upper body at the same time. Stepper has a timer, speed and calorie counter. Full body workout. 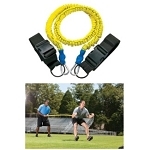 Resistance bands work the upper body while the steps work the lower body. Includes speed, timer, steps and calorie counter. Also track your weight and fitness goals with the Competitive Edge Tanita Scales. Iron man athletes should check out the Tanita bc 1500. Also view our tanita scale ironman scales. What are your thoughts of the Sunny Fitness Twister Mini Stepper? And its particularly true with regards to your diet for building flat abs. Part from the exercises purpose is to will give you means to raise your body’s metabolism. They are really ineffective yet people try to do hundred of these, for what.